This is the recipe that accidentally led to my Perfect Paleo Pancake recipe. Creating a Paleo crepe was a long time goal, and I am so happy to finally be able to share a truly delicious Paleo crepe recipe with you! This is yet another green plantain-based recipe (see my Plantain Cracker recipe and the video below for tips on cooking with and storing plantains). Crepes were always a special treat growing up. We didn’t own a crepe maker so my mom made them the old fashioned way in our old cast iron frying pan. I always liked them plain with just a dusting of powdered sugar on top. My brothers usually ate them with jam in the middle. As an adult, I rediscovered crepes while gallivanting through Paris with my then fiancé (now husband). Crepes are a standard street food in France and that’s when I discovered the sheer joy of a Nutella-filled crepe (Nutella is a chocolate hazelnut spread and one of my greatest weaknesses before discovering Paleo). Two great loves thus came together into one delicious diabetes-inducing addiction. 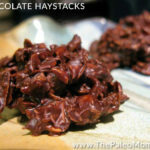 So, creating a Paleo version of this favorite treat makes me very, very happy. These crepes are nut-free (and coconut-free if you substitute another oil for the coconut oil), although clearly the Paleo nutella isn’t. Other delicious fillings or sides for crepes are fresh fruit, fruit spreads (like jam or coulis), coconut cream (the top fatty half of a can of full-fat coconut milk), coconut cream mixed with lemon juice, and nut butters. You can also try a savory filling with these crepes or even use these crepes in place of tortillas for enchiladas. You could even roll some deli meat and Paleo mayo or mustard into these crepes for a fun lunchbox food! Crepes are easiest to make with a crepe maker or a crepe pan. However, these specialty kitchen tools are not a necessity. I made my crepes with a 12” non-stick omelet pan (the edges are at a good angle for getting underneath the crepe to flip it). Sure, it’s more work and my crepes are not as thin or even as they would be with a crepe maker, but it still works for me. But, if you find yourself wanting to make these often, investing in a crepe maker is definitely worth it. This recipe makes 6-7 crepes and is easily doubled. Blend hazelnuts in food processor or blender for 2-3 minutes until a paste begins to form. Melt chocolate and coconut oil together (you can use a small saucepan over low heat or your microwave). Add warm chocolate to hazelnuts and blend an additional 2-3 minutes until completely smooth. Let cool. Store at room temperature for up to a few days or in the refrigerator for a few months. Peel plantains (I find it easiest to quarter them first) and place in a blender or food processor with the rest of the ingredients. Puree batter for 2 minutes until completely smooth. Meanwhile, heat a crepe maker, crepe pan, or omelet pan over medium to medium-high heat (I set my element to 6). Cook for 45-75 seconds on the first side, until the top looks dry. Flip and cook for 15-30 seconds on the second side. Add more coconut oil to the pan and repeat with the remaining batter. 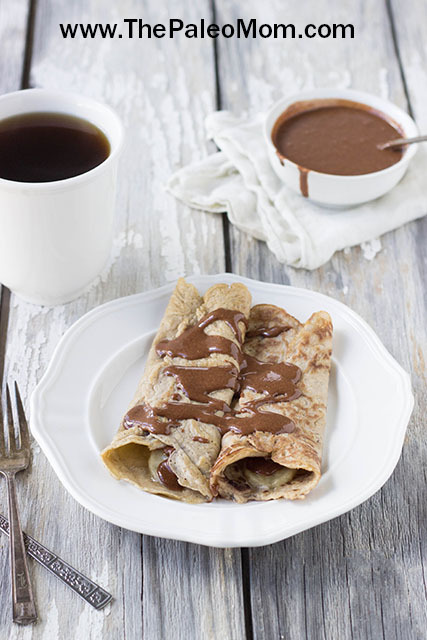 For nutella crepes, spread 2-3 Tbsp of Paleo “nutella” over one side of the crepe and roll or fold. 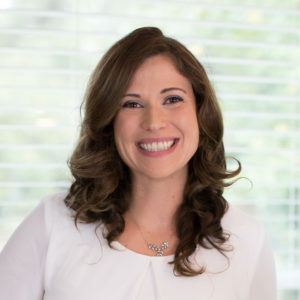 The #1 Tool for Paleo and AIP success! Create completely customizable and versatile meal plans with thousands of top-notch recipes; make shopping a breeze with the app, and even get reminders for meal prep timing! 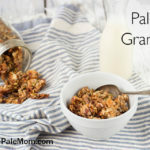 Get all my recipes from ThePaleoMom.com for just $1 more when you sign up for meal planning with Real Plans! Want to track what you are eating? Check out the NEW Real Plans Macro Tracker! Do you need to use a plantain or will a banana work? I don’t know if banana would work. I think so, but it would change th flavor. Did you try a banana I’m curious to know if it worked and if you need to use a very ripe banana or a greener one. Plantains are very hard to find in my area. You could use any nut you like! that’s what I thought…thanks! made your crackers out of plantains yesterday…yummo!! Do you know if these can be made without the filling & frozen? These certainly can be made without the filling. I think you could freeze them flat. You might want to freeze on a cookie sheet and then stack after frozen so they don’t stick together. 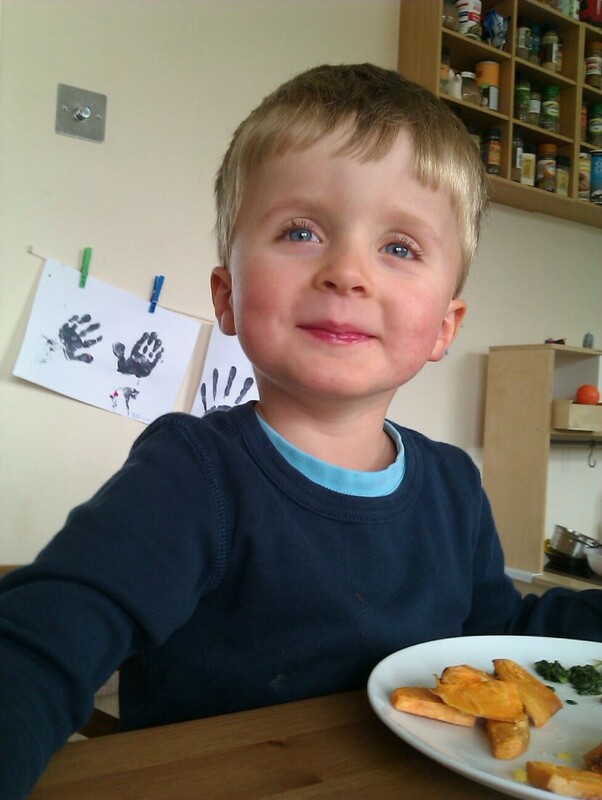 PaleoMom – these crepes are FANTASTIC. Thank you. Great recipe. Now need to try the nutella. I just got done making these, and I’m in love!!!! Om nom nom nom!!!! My kiddos are going to be so thrilled to take these to school <3 They have dearly missed sandwiches and tortilla wraps for the past year. I bet these would do nicely for burritos and enchiladas, too…. oh you have just changed my life! I have tried a million Paleo pancake and crepe recipes and they are always, meh, ok. But THESE! the texture is perfect, the flavor just right, so easy, no special expensive flours and my kids are begging for me. THANK YOU THANK YOU! I made the crepes this morning and OMG they are sooo good!! The kids want them every day now. Thank you so much for the recipe. These are so fantastic. I would love to hear what other filling people have used. We have a variety of food sensitivities (me:dairy, daughter: nuts) and picky eaters in the house, so the more options the better. Oh my yum! Those look awesome! These were so good thank you for the recipe! I saved the leftover creeps for wraps! Made the crepes and they were so yummy! The Nutella though didn’t get smooth like your picture. I used 100% dark bittersweet chocolate. Would that have made a difference? Did you soak the hazelnuts? OMG, those look so good. My inner critic is saying “no touch! Too fattening!” I just started looking into the Paleo diet…after finding your website I may stay here forever. Thanks for all the inspiration and perspiration. You did all of the work for the rest of us. Ok, I did one more filling, leftover shredded pork, yummy! What a versatile crepe, it can go with a sweet or savory filling, and so quick and easy to make. Thank you again! These are just amazing! My husband who love “regular” crapes loves these! Thank you for sharing! These were yummy, but my batter didn’t swirl around like you said. I had to spread it to form my circle. I wonder if I should add more water to the mix? Mine also felt like grains on the tongue…is that about normal? I blended it for longer than the 2 minutes you suggested. My plantains were half green, half brownish, maybe that’s why? I had never had plantains before. Hubby had them with scrambled eggs & chorizo. I made some blackberry chia jam & they were YUMM!!! Yes, sounds like they need to blend longer. They should still work with partially ripe plantains, although the flavor would be slightly different. How many Crepes does this recipe make? They look delicious. Depends on the size. 10-12. I’m so thrilled to find your website. plantain as a base is so ingenious! Here’s my question; I made these tonight for the first time to have as a dinner savory crepe- and they came out almost amazing. The texture and ease of cooking was fantastic. However- there is a taste- hard to describe- and rather subtle- but definitly there- for lack of better word, I’d say fishy?… rancid? the coconut oil is fresh, the eggs laid by the chickens yesterday…. do you know what I’m talking about? is this a plantain thing we have to love or leave? i just put ham on them so the fillings flavor was not overpowering enough to cover it- and sad to say my kids declined them- and i must admit- i wasn’t super into them either- is this something on my end? thanks for the reply- and despite this i’m super impressed and excited for other tries of your reciepes! Totally. That’s the slightly ripe green plantain taste. If you get greener plantains, the flavor is more neutral (for lack of a better descriptor). They are in the same family as bananas, but are bigger and starchier. They look similar and are often close to bananas in the store. Oh my goodness! 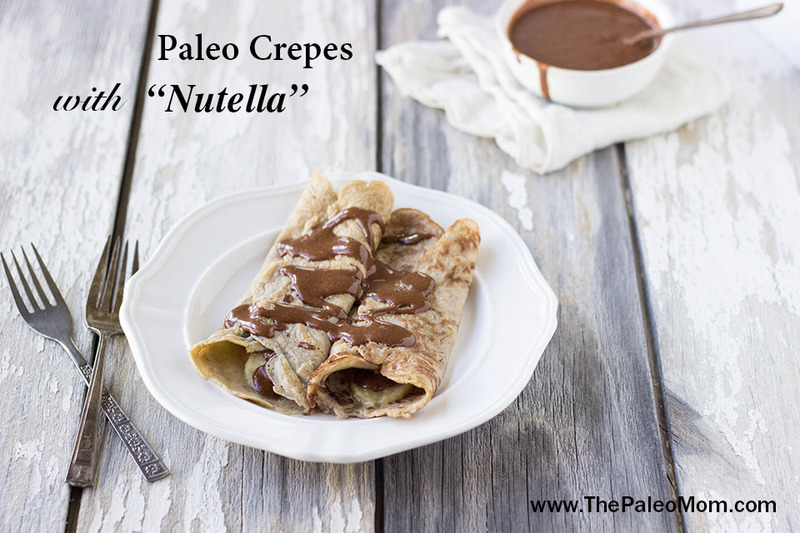 I have been looking and looking for a Paleo Crepe receipe, and know I have found one. Thank you so much. I am looking forward to making these. Thank you for the great ideas! I have been making a banana pancake that is just a banana and egg mashed together and adding small berries to the mix just before going in the pan. This crepe version looks very versatile and I’m definitely trying it when we are in Hawaii next, too. Any tips on selecting Plantains? I made too much! im the only one eating them! I was going to store the *dough mix* and then i realized, shoot, it’s got eggs..I guess i need to cook them all? This was a HUGE failure for me 🙁 I don’t know what I did wrong but they turned out weird and not “bready” like yours look in the picture. The just fell apart when I tried to flip them. I am so sad. My nutella didn’t turn out either but I think it’s my food processor, I have a mini prep and I didn’t want to burn it up having it run too long so it didn’t get smooth. So I made cookies out of the nutella…lol. They are good though. Thank you so much! I tried the nutella recipe in my vitamix and it came out kind of rough. Today I pulled it back out of the fridge, put it into the food processor and added some coconut manna. The texture then looked like yours and the flavor was better than my original. The crepes were awesome. On a side note, my hubby is hooked on your plantain pancakes. Today he found my baggie of plantain crackers and informed me that I needed to make more. Thank goodness the Aldi’s in town has large green plantains for 39 cents each. Your link goes to raw filberts. Do you roast them before use? I just made these crepes and they are delicious and so easy! Thank you so much. I am going to make the nutella now :). I don’t know if it changes the characteristics of the plantain, but if you quarter them & then boil them briefly, the peel pretty much falls off. When I look up plantains and white potatoes, they are about the same amount of carbs which turns into sugars. Help me understand how choosing plantains is a better choice. They are ore nutrient-dense and do not contain glycoalkaloids. You can read my nightshade posts under the Autoimmunity menu for more information on glycoalkaloids. Ah. Maze. Ing. Haven’t made the “nutella” yet, but topped these with berries and whipped cream (I still use diary sparingly.) Excellent as a once a month treat, my husband and I have decided. I am Learning the details of Paleo and trying to prepare myself to go Paleo. 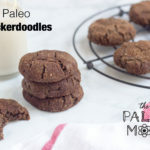 I am confused, how are these considered Paleo when you add bittersweet chocolate? Delicious! I managed to find plantains just after finding this recipe and watching your video on plantains so I tried this recipe out. I don’t have a crepe pan so I just used a regular non-stick frying pan. The first one was a bit too thick and wasnt spreading so I added more water to my batter- after that they spread out perfectly. I didn’t have hazel nuts on hand so I added about 5 TBS of peanut butter to my chocolate/coconut mixture (I know, not Paleo but I like pb!) and I added about 1 TBS of honey to the mixture. Added some berries and drizzled some maple syrup on top – perfect! 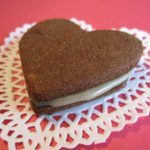 Even my non-Paleo husband loved these. Will definitely be making again but will whip up some coconut milk cream to top it off next time. Holy Paleo crepe Batman! 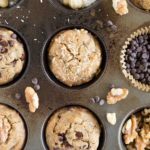 I bought 3 plantains in anticipation of some weekend Paleo baking and of course headed straight to your site. Well clearly I should have bought 700 more because while I nibble on your plantain crackers with chicken liver pate and just gobbled up all the crepes with my 3 girls we are desperately in need of mass production to keep us through the week! Needing a chocolate fix can indicate you need some magnesium. Just a thought. Thanks for the reminder. I have the supplement here at home, and keep forgetting to take it. Epsom salt baths also give your body magnesium transdermally, or so I have read. any thoughts on tying this with an equal amount of another starch? 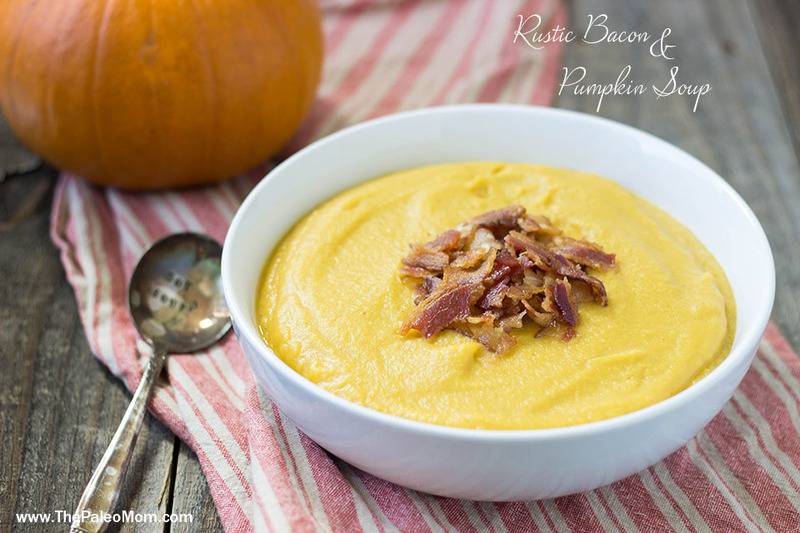 say, pureed leftover sweet potatoes? 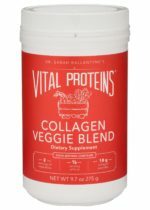 i guess it would change the flavor but i’m wondering – would it work? What could I use instead of Plantains? These look so yummy! Is there any substitution for the eggs? Unfortunately I am allergic and flax and chia are not allowed on the aip diet. 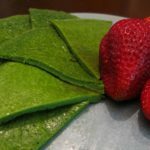 This is the best gluten free crepe recipe I have found. I feel like I have tried them all with so so results. Love the plantains. Will try more recipes with them. I tried the pancake version and loved them, now this is perfect to use as a wrap. I’m going to make a bunch and freeze them to pull out and use as a grain-free “tortilla”. Thank you for sharing your genius with the world! 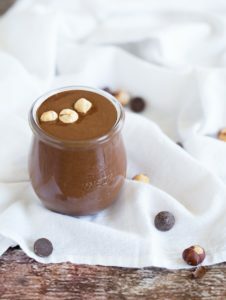 How can the “nutella” be Paleo when the bittersweet chocolate has sugar in it? Trying to think where I might find plantains in Australia – are they used in Asian cooking? Gotta get a plantan for for my Saturday morning breakfast treat. Oh yeah! I’ve missed crepes so much. These are fantastic! Hey all I just wanted to let you know that this morning I steped out to try these crepes with my 2-3 week old GREEN BANANAS that never seem to ripen! I did 5 bananas with 6 eggs then added some cinnamin and vanilla. It worked! The only thing is that they broke a little easier then the plantain ones, I found that making them a little thicker on the pan made them a little bit more durable, but none the less I still was able to eat them as a crepe! I got 8-10 crepes! I made these for dinner along with “regular” flour crepes for my family. Holy wow, they were awesome! My husband said he couldn’t tell the difference. I did have to thin the batter with more water and I added a tsp. of vanilla. Now I am excited to try the leftovers all week for breakfast! These are awesome!!! I am making them right now, and they won’t stay on my “done” plate! They are delicious, but they are kind of fragile even when I make them a little thicker. Is there something I can change? Hello! This blog is very exciting! I am learning so much from you! I want to start Paleo diet and to introduce it to my family, but I have a major problem. We live in Bulgaria and I have never seen green plantains in the market here! Can I substitute them with bananas or something else? And also a lot of your baking ingredients are not familiar here or are too expensive (like almond flour or coconut flour, if it is possible to find ). Can you help me with suggestions? I am ok with nuts, especially sunflower seeds, cause they are much cheaper.